This gently exfoliating scrub nourishes while it cleanses. By gently removing all dead skin cells it relieves tight congested skin and heals the epidermis. 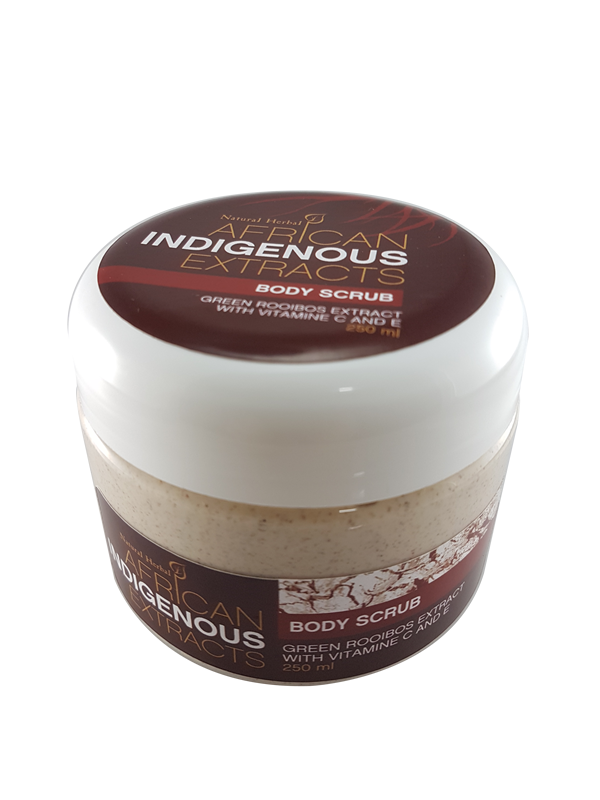 Our body scrub contains Rooibos extract and Vitamin C & E. Rooibos extract softens and calms the skin and is known for its-anti aging and wrinkle decreasing properties. Rooibos extract rejuvenates the skin and relieves irritation; it is also a mild astringent, which helps return pores to their normal size. Added Vitamin C keeps skin healthy and toned while the Vitamin E fights free radicals and provide defense against wrinkling and ageing. The combination of these ingredients provides the skin with a potent formula against daily stresses and leaves skin rejuvenated and with improved elasticity. Leaves the skin exfoliated, refreshed and with a youthful glow.